covering the cold hard ground. will not make it through winter. there are no acorns this year. that they usually do not. This entry was posted in Animals, Nature, Photo Essay, photography, Poetry, wildlife and tagged acorns, food, Ice, Snow, Winter. Bookmark the permalink. Deer are very hardy, hopefully they’ll all make through this winter. Hope so…but there are a LOT of them around here, and without the acorns, I don’t know. There really is nothing that can be done. It’s in the hands of Mother Nature. 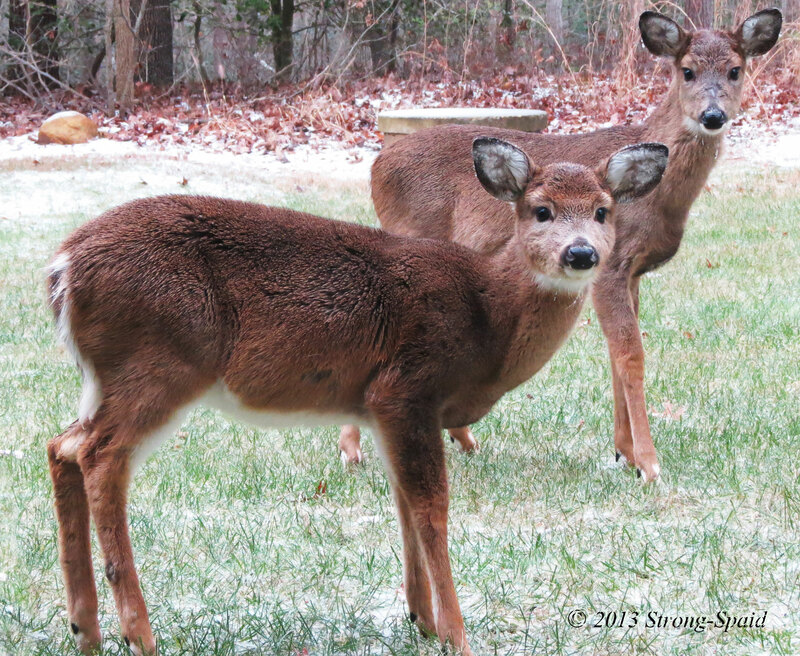 Even if I throw a whole bag full of “critter” food out into the woods….it is gone within an hour. There’s too many deer. That’s because there is federal park land around us and it is a protected area. Because there are no acorns around, they are even eating the bird seed (and I think they would have to eat pounds of bird seed to do themselves any good). People up in Northern VA have been told to stop putting out bird seed, because black bears also needed the acorns to make it through the winter—and the bears, in desperation, have been showing up in people’s yards looking for food. I have never seen a bear around here, but that would certainly be intimidating to see one of those looking into my basement window. We are seeing lots more deer around the house now too. I thought it might be beccause we lost our big dog so there are no threats now. Never thought of the acorns. And you are right, they are eating things they left alone before. So sad because they are such beautiful creatures. Your photos bring us right into their families. Maybe the deers out your way will find something good to eat in the mountains. I do think they are creatures of habit, though. They seem to prefer to follow the same path every day, even if there is not much to eat along the way. Beautiful Captures – these deer have some winter coat going on too:) Happy Day! Yes—their coats are much darker and thicker than they are in the summer. The White tail species has seen this before and they are very resourceful. they flourish here through some very harsh winters and there isn’t an acorn within a thousand miles. I think that the deer might have a better chance to find alternate food sources in Montana where there is a lot of wide open land. Here the land has been taken over by highways, roads, stores, and houses. A lot of the underbrush has been stripped out. 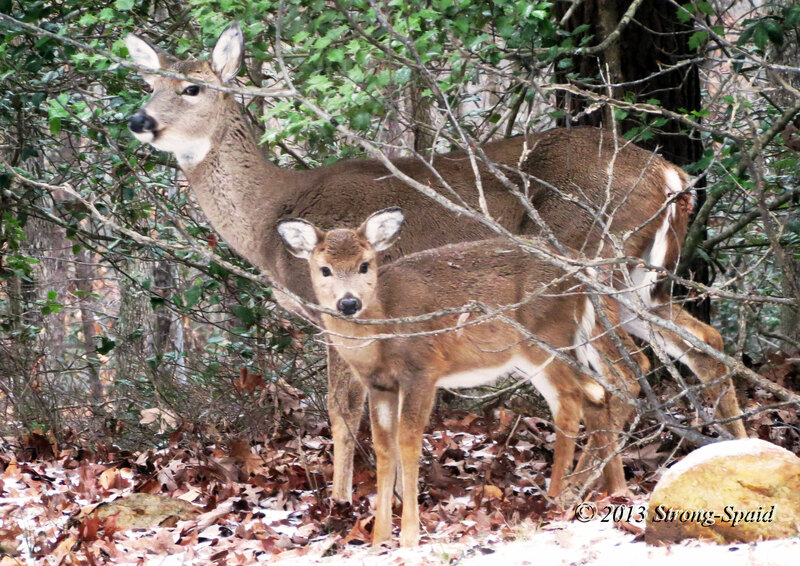 Homeowners who have spent money on “landscaping” around their houses, get upset when they see hungry deer hanging around….and they chase them away. Except for the battlefield park around us, I don’t know if there are enough good places for them to look for alternate food. As with the deer than come through our place every night, I wish them well. Many years ago I planted a pasture grass in the front of the house , about a half acre. I mow it in summer, but come fall I let it grow long. It’s surprising how many deer paw through the snow and feed on it. 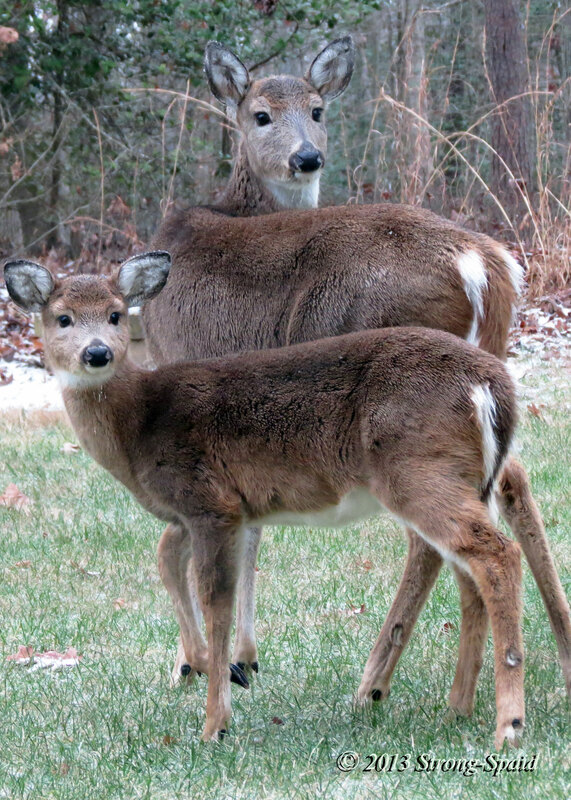 Actually I see the more “urban” deer doing well in winter, of course at the expense of people’s landscaping. They will go around to all the houses, searching for food. They will eat expensive landscaping and people will get upset. BUT, the truth is….they were here first. One of our neighbors had $7,000 damage to the front end of her new car after a deer jumped out into the road. The car kind of survived, but the poor deer did not. 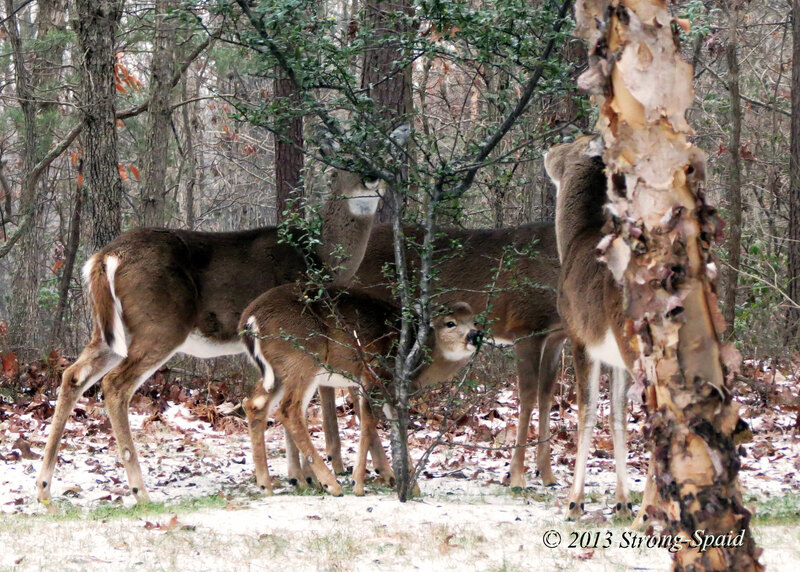 yes, it is normal for my family to drive slow in the areas we know deer populate…we’ve lived with them for so long! Sadly sometimes things can’t be avoided! My son was driving a truck and the poor deer didn’t survive…he felt badly and made sure it was removed as he didn’t want the school children to see it on the side of the road in the morning! they are indeed very beautiful – I did not think about the acorns either. I know there have been more bears around here in northcentral PA than before. Poor things – my heart goes out to them. Yes. The bears rely on acorns too. I hear they have been raiding bird feeders, looking for food. It would take a lot of bird seed to satisfy a bear! They look so fuzzy and I love the way you’ve captured the wee one’s little face looking up at its mama. How sweet. Probably thinks mom can do anything! But this mom looks a little concerned. Mary, these are precious photographs of deer, living in a big city as i do i envy your proximity to wildlife. honestly, i’ve never heard of acorns not falling, has that happened before in your area? Apparently it has happened before, but not to this extent. Some years there are a lot of acorns, and sometimes there are not many. It’s a cyclical thing, I guess. But this year, there are none at all…which is not good for the wildlife at all. oh and i almost forgot to ty for liking so many of my poems lately, and for doing a little digging in the archives. you resurrected a few i had forgotten about. I thoroughly enjoyed wandering through and reading…..
As always, I love your photography and poetry! So poignant… beautiful photos, Thanks for visiting my blog. I love your story about Christmas eve….and singing. We used to carol in the streets when I was little. Now, no one does that around here anymore. I miss that. Nothing brings people together, esp. in the dark and cold of winter, like singing 🙂 Merry Christmas, happy holidays to you! Mary, these are such beautiful pictures. I hope your furry friends make it through the winter. Their thick winter coats look like luxurious blankets! I hope they are doing OK out there too. Merry Christmas Wendy! Hopefully they will be OK. There are 3 more months of cold weather and then the spring will return–bringing new food for them. What a thoughtful winter…to pass by without woolens! Great choice of words, and what an interesting mental picture that makes! Deer come in my yard every year also, they always eat plants and trees where I live so they should be ok. Tree bark has a lot of nutrients. So far, it has been an abnormally cold winter in Virginia and another snow and ice storm is on the way. 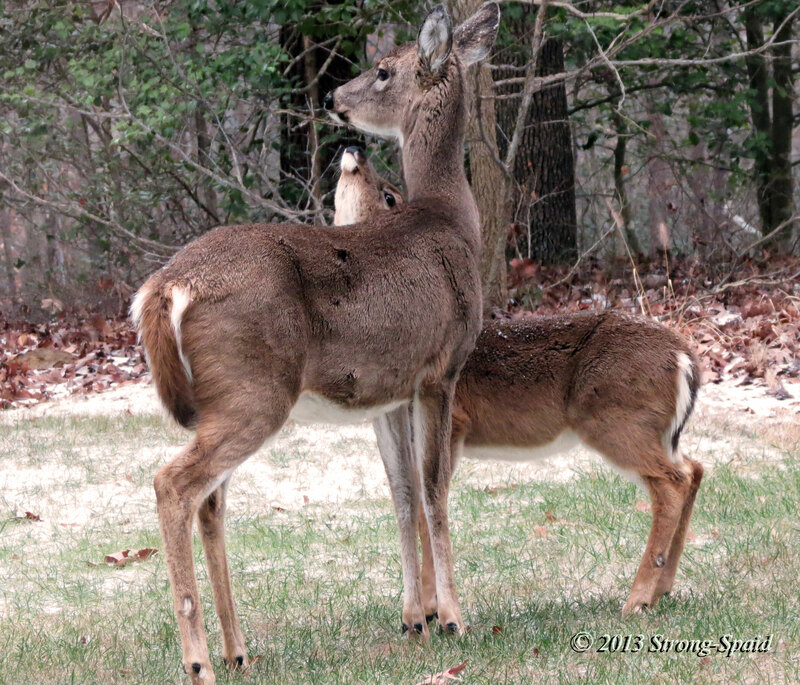 The deer that I used to see in my backyard–I haven’t seen them in awhile. I do hope they are OK. My friend recently had a hungry squirrel chew through a screen on her deck and eat part of a cheesecake that she had just baked for her husband’s birthday. I didn’t know squirrels ate cheesecake…but I guess when your hungry, anything edible is good food! Thanks! The deer are beautiful. They leave a lot of “deer ticks” in the yard though, so we have to keep a sharp eye out for them.